Left to right: Nemuna Ceesay, Benjamin Bonenfant. Photo courtesy Jenny Graham and Oregon Shakespeare Festival. The works of Charles Dickens are classic melodramas, full of unlikely situations, emotions running high, and characters writ larger than life. It’s surprising, then, that stage adaptations aren’t more common. The Oregon Shakespeare Festival’s premiere adaptation of Great Expectations, directed by co-adapter Penny Metropulous, does the work – and Dickens – justice with strong themes and a stellar cast. In keeping with Dickens’ novel, the adaptation of Great Expectations features extraordinary twists of fate, such as sudden changes in status and reputation: The main character, Pip (Benjamin Bonenfant), transforms from abused orphan to aspiring gentleman thanks to an unlikely benefactor. Bonenfant accurately captures Pip’s character in the midst of this whirlwind, more mutable and prone to error than, say, Oliver Twist, but still possessing a heart and a capacity for change. The other characters can be divided between realistic, sympathetic comrades to Pip and larger-than-life caricatures. Among the former is Nemuna Ceesay’s Estella, who, although she claims her sole mission in life is to break men’s hearts, acts with a cold sympathy. Ceesay’s performance demonstrates to the audience both the repercussions of Pip’s elevation into the upper class and the integrity required to continue with her life choices, even when she knows they won’t make her happy. Herbert Pocket (Dylan Paul), as well, is a relatively grounded character, whose willingness to remain by Pip’s side throughout the play’s tribulations is nothing less than heartwarming. In the latter camp lie characters like Pip’s abusive sister Mrs. Joe (Amy Newman), his pompous great-uncle Pumblechook (Brent Hinkley), and church clerk/aspiring actor Mr. Wopsle (Cristofer Jean). Rather than being well developed themselves, these characters9 support the characterization of Pip: They possess opinions solely to go against those of Pip’s, and, by association, the audience’s. That said, it takes significant comic talent to make these characters funny instead of enraging, and all three of the actors pull it off. There are two people who have a hard time fitting into either category: the escaped convict Magwitch (Derrick Lee Weeden) and Miss Havisham (Judith-Marie Bergan), one of literature’s most famous widows. Dickens’ supporting characters are typically stereotypes; however, Weeden plays a nuanced Magwitch, exuding a feeling of danger and unpredictability even as he treats Pip kindly. Bergan’s Havisham, too, is ever-changing, moving from genuinely friendly to Pip one second to crazed sorrow the next. Her acting is at once scary, intricate, and fascinating. Similar to works by director Mary Zimmerman (Treasure Island, The White Snake), which use minimal sets to better switch between multiple scenes, set designer Collette Pollard created a relatively featureless stage with dark colors to suit the wide variety of locations present in the play. The set doesn’t make any grand statements, but its use of space and pattern creates a vague air of tension and peril. Small candles scattered over the back wall allude to the mourning that has pervaded Pip’s life, as well as the light of hope that suddenly appears in front of him. 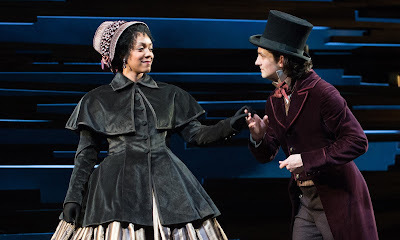 The Oregon Shakespeare Festival’s adaptation of Great Expectations is an ideal form for experiencing Dickens. Dickens has developed a reputation for being long and complicated, yet the stage adaptation is easy to follow despite its numerous twists and turns. For people unaccustomed to reading Victorian literature, it serves as a great introduction to a legendary author.